For the first time, author Seth Abramson writes the full, explosive record of how an American president did the unthinkable. The current president of the United States Donald Trump compromised the American foreign policy in exchange for covert election assistance and financial gain. In Proof of Collusion: How Trump Betrayed America, Seth Abramson tracked each one of these far-flung reports. Now, he finally gives the readers a record everything that happened. The professor, the former criminal investigator, and the attorney have used his exacting forensic acumen and legal mind to gather, organize, and analyze every piece of pieces of evidence about the Trump-Russia story. The book's conclusion is clear: the case for collusion has been staring at us in the face. 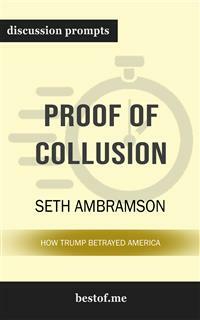 In this comprehensive look into Proof of Collusion: How Trump Betrayed America by Seth Abramson, you'll gain insight with this essential resource as a guide to aid your discussions. Be prepared to lead with the following: Discussion aid which includes a wealth of prompts and information Overall plot synopsis and author biography Thought-provoking discussion questions for a deeper examination Creative exercises to foster alternate “if this was you” discussions And more! Disclaimer: This is a companion guide based on the work Proof of Collusion: How Trump Betrayed America by Seth Abramson and is not affiliated with the original work or author in any way. It does not contain any text of the original work. If you haven’t purchased the original work, we encourage you to do so first. Have you ever wanted to improve your understanding of Proof of Collusion? Or perhaps you are simply struggling to learn the subject matter? It’s a simple teaching technique that helps students learn and readers to grow. With versatile discussion questions for each major criteria regarding Proof of Collusion, these discussion prompts are designed to help surface crucial discussions that are capable to assist toward thinking and learning on a deeper level.